You can use search to find information in both the Knowledge Base and the Community at the same time. The search results are displayed in two columns, with one column listing the Knowledge Base results and the other listing the Community results. Tip: If you are searching for information specific to a product, it is very helpful to use the item number within your search term(s). All Link products have a 4-digit item number (these are the first 4 digits in any catalogue number for the product). For example, 6-FAM's item number is 2134 (an example catalogue number is 2134-B250 for a 250mg pack). Searching the Knowledge Base using the term "2134" will bring up all articles related to 6-FAM. You can browse the content in one or the other by clicking Knowledge base or Community. See the following sections for more information. The Knowledge Base is a collection of information on our products and services, written by staff here at Link. This is where you will find the latest protocols for use and technical support articles relating to our products. The Knowledge Base consist of categories, sections, and articles. 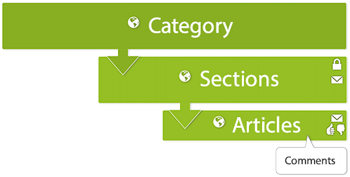 Articles are grouped in sections, and sections are grouped in categories. To get around the knowledge base, you can use search or browse categories and sections. Use the navigational "breadcrumbs" to go home or to a parent section or category. If you are a registered user you can also subscribe to sections or articles so that you're notified when somebody creates or updates an article. Only staff at Link can post or edit articles, however registered users can post comments. The community is where you can ask questions, provide answers, or share ideas. Most questions or ideas are associated with topics of discussion. Participate in the community by asking questions, providing answers, or sharing ideas. If you think somebody's answer to your question is correct, you can accept it as the answer so others can benefit from the information too. You can vote on others' contributions. You can also track issues by following discussion topics or specific questions. You'll be notified when somebody creates or updates a question or idea, or adds a response. Before you post a question, it's always a good idea to run a quick search to see if the question hasn't already been answered in the community. Your fellow users will appreciate not having to answer the same question over and over again. Enter your question or idea and any details about it. Ideas can include tips, feature requests, or any other useful information you want to share with fellow users. If you wish you can format the text using Markdown. Markdown is a simple markup language that lets you add bold and italic, bullet lists, headings, and more to your text. See the Markdown syntax reference by John Gruber on the Daring Fireball website. Select a topic for the question from the dropdown menu. Click the checkmark next to the answer. Click the topic or question. Click the Follow button next to the topic title or question.